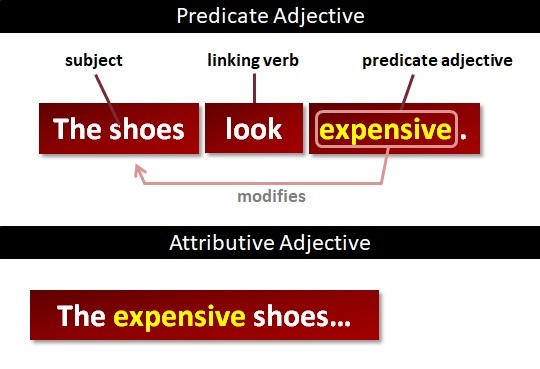 Predicate Adjectives | What are Predicate Adjectives? A predicate adjective is an adjective that follows a linking verb and modifies (i.e., refers back to) the subject of the linking verb. A predicate adjective contrasts with an attributive adjective, which typically sits immediately before the noun it modifies. Below are some examples of predicate adjectives. In these examples, the predicate adjective is shaded and the subject being modified is in bold. If you look good, you don't need a purpose in life. What can you say about a society which says that God is dead, and Elvis is alive?